I have to admit that I was getting a little ahead of myself in September by using several Autumnal beauty products but when the weather is so dodgy who can blame me? 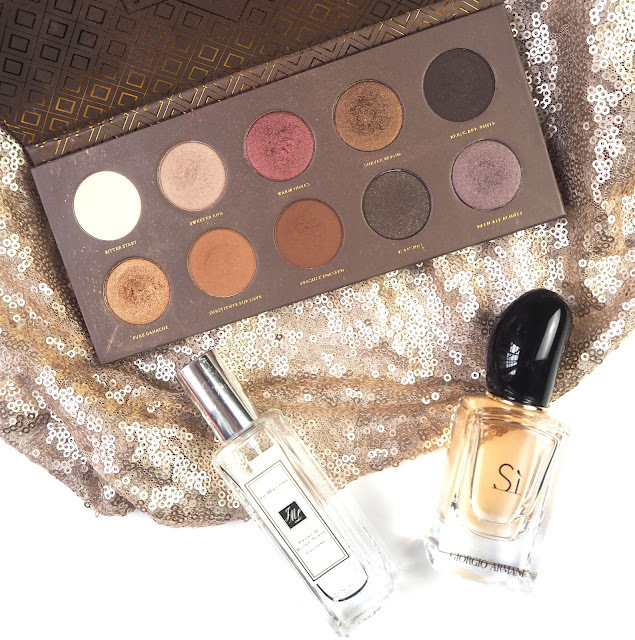 Lets start with an oldie but a goodie- the Zoeva Cocoa Blend Palette. I have loved this thing for a long time now and go through phases of using it religiously. September was one of those phases, I just think the colours are perfect for Autumn with the golds, purples and red toned browns. It's one of those palettes I just never tire of and enjoy using time and time again. I've been trying to make a bit more use of my perfume collection and these two scents have got me through the month. Jo Malone's Peony & Blush Suede is a gorgeous floral scent and being a cologne you only need one or two sprays for the whole day. I've had this 30ml bottle in my stash for a long time now and its still going strong. The second fragrance is Armani Si which again is a floral scent. I actually got this is Spring but find it has quite a musky tone to it so wasn't gravitating towards it when the weather was warmer. I like both of these because they are floral, which is my favourite for a scent, and very distinctive. Next up are the two products from the L'Oreal Paradise range I picked up (I did a full review for those of you interested) in August. I have been super impressed with both the mascara and the brow pomade. The mascara gives full, big lashes, which is always the look I go for and the pomade is ideal for filling in and carving out those brows. I hope L'Oreal add to the Paradise range which something equally as good. A few weeks ago I was lucky enough to win some products from the new Being By Sanctuary range and one of them was the Cloudberry & Lychee Blossom Hand Cream. The formula of this is incredibly moisturising but lightweight at the same time, so no awful greasy hands situation. This has an amazing sweet, floral smell but its not too overpowering, I feel like they got this just right. It's also a small enough tube to be chucked in your handbag. I can't wait to try more from this beautiful range. 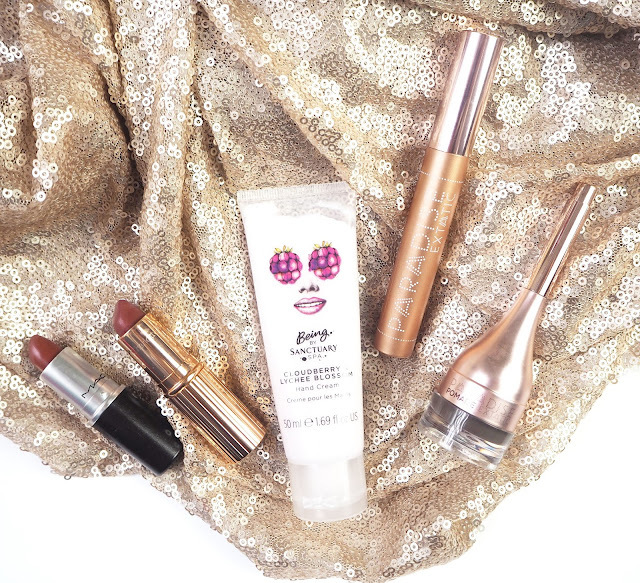 It wouldn't be a favourites post without me mentioning a lipstick and this month I have two. The first one is Charlotte Tilbury Bond Girl which is a gorgeous burnt, red shade, ideal for this time of year. As its from the Matte Revolution range it has a matte finish which fortunately doesn't dry your lips out, it stays feeling comfortable and moisturising whilst wearing it-hooray! Of course the packaging is up to the usual standards of Charlotte Tilbury ie rose gold and to die for. The other one I've been loving is Mac Retro and its in a fairly similar vein to Bond Girl when seeing them swatched next to each other. However, I would say Retro is darker than Bond Girl and on the bolder side. I like Retro because again it has those Autumn vibes and I always think a red lip looks good when your outfit consists of dark colours, which mine usually do in Autumn/Winter. The Satin finish is a big plus as it has just a subtle sheen to it making it long wearing. Which products were you loving in September? So many great choices! The weather definitely made me start feeling like Fall way earlier than it even came. I need to try a Zoeva palette. They look gorgeous! Nice lip choices also!